Well it’s been a pretty good August for imaging. While most of the world seems focused on M101 supernovae or Comet Garradd, I went after a slightly different target: M33. I’ve imaged M33 on several occasions with different equipment so I thought I would continue to add to the collection — it’s been almost a year since the last images were taken. 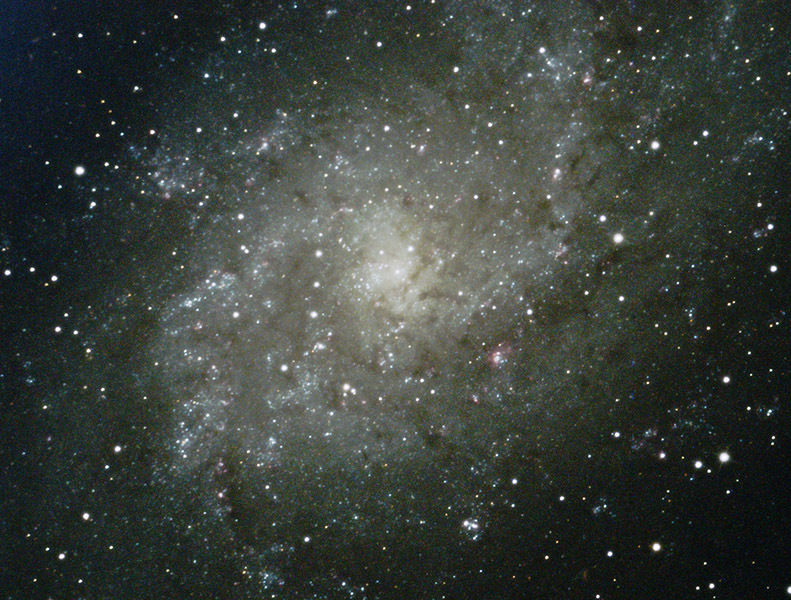 While M33 is very diffuse, it’s also very large. So large that to grab all of it’s spiral nuggets would require a low magnification or a giant imaging circle. Somehow I always seem to miss part of it! This image is from the AT10RCF, Orion Starshoot Pro v2, 13x 5 min exposures. Enjoy! This entry was posted by admin on August 28, 2011 at 1:06 pm, and is filed under Galaxies. Follow any responses to this post through RSS 2.0.You can skip to the end and leave a response. Pinging is currently not allowed.